In this last of our three part series on Up North breweries (soon to be followed by some updates on Duluth when Dan and I get to All Pints North) we cover Portage Brewing and Bemidji Brewing. This was my first visit to these areas and breweries, so I was excited to get to check everything out! With me on this excursion were my wife Sarajo, and Jim and Lori Stroner. Check out the reviews of Jack Pine and Roundhouse HERE, and Gull Dam and Big Axe HERE. This is a brand new brewery located right in the center of Walker, Minnesota, opening at the end of April of 2017. Normally I don’t tend to review breweries this “fresh” but when I check them out and they’re doing a good job, I’ll give them a shout-out! When we arrived on this particular Saturday afternoon of a holiday weekend, the town was packed to bursting with weekend vacation traffic. The morning had been crappy and raining, keeping folks from doing outdoor things and leading to more “town” traffic than expected. This spilled over (along with the deluge from the heavens) into an incredibly packed taproom at Portage Brewing. The building was at one point a hospital, and has served various other purposes in time, most recently laying fallow and decrepit for the past 10+ years. A small deck sits out in front, now empty due to incessant downpour. Our group shook off our beaded water supply like a pack of dogs after a swim in a muddy stream, finding barely enough room to enter! Looking side-long at my wife (who does not like crowds much), I didn’t wait for permission before I ducked and weaved my way to the bar, using my smaller size to advantage while darting about like a slippery eelpout. Popping up nearly under some tall dude-bros, I managed to quickly get a sampler of beers ordered up. Once I had beer in hand, I was able to look around the place more closely. Not surprisingly, the decor was thick with pinewood floors, rails, paneling, bar, and heavy rough-hewn timbers for supports. The brewery has embraced its northwoods location with this theme, but seems to also do so in other ways. Their logo is a simple and effective silhouette of someone paddling a canoe across water. They have PET plastic bottles for growlers for easy pack-in and out as well as reusability. With SRO the order of the day it took us a while to find a small unclaimed patch of rail to rest our samplers upon whilst dodging elbows and gesticulating hands, but we persevered. Here’s were I get to judge the beers based on style accuracy, overall quality, and personal taste. 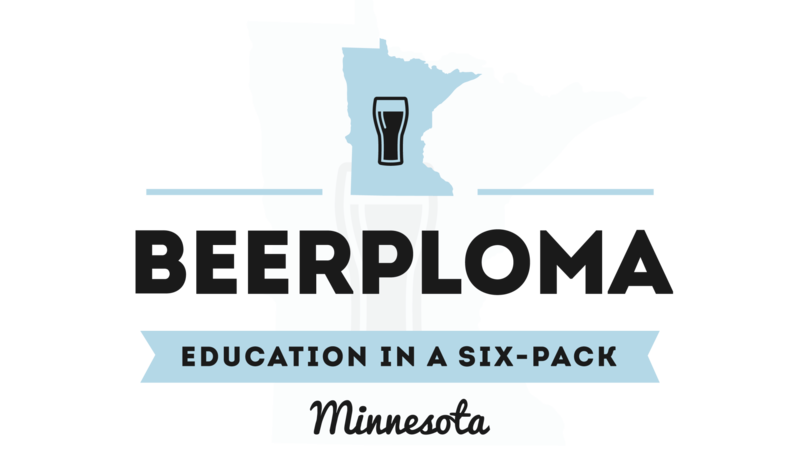 I have over 25 years of homebrewing experience, am a BJCP judge, and just really like beer! 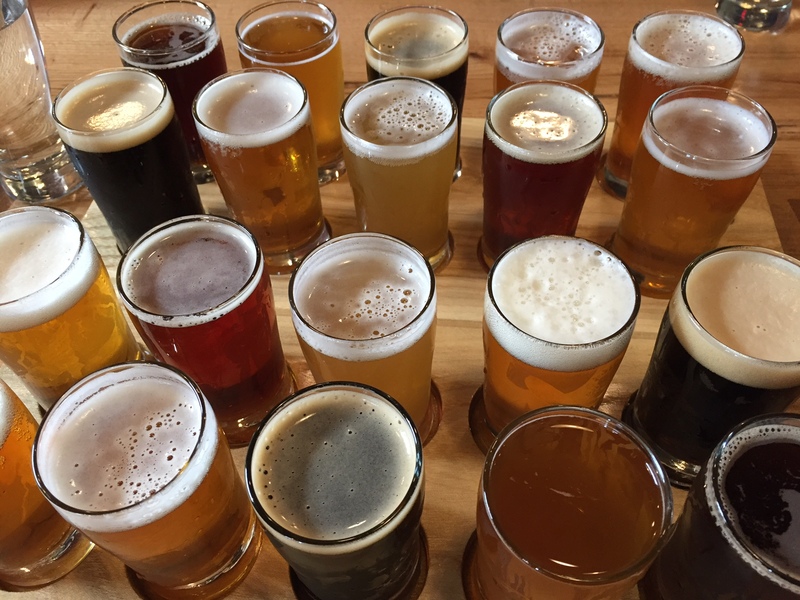 I rate beers on a 0-5 scale with 0 being industrial paper-plant runoff water, 3 being an average beer that I would drink a pint of, and 5 being one I’d love to fill my bathtub with and roll around in. Cocoa Wheat Porter: 5.6% ABV, 34 IBU. Coppercamp Amber Ale: 6.3% ABV, 32 IBU English Amber. Wild Table Beer: 5% ABV, 24 IBU. Inspired by the Belgian Table Beer (or Belgian Single) this is also made with wild yeast and wheat. Coffee Cake Blonde Ale: 4.7% ABV, 24 IBU. Made with locally roasted Kaffe Havn coffee, Vietnamese cinnamon, and vanilla. We were all pretty happy with the quality of the beers here, and especially when you consider them just opening. I know, I know, breweries should be putting out good beer right away! But honestly, a lot of the breweries that I discounted completely based on early tastes of their beers have become much better over time. Still in this current craft beer climate, you really do need to lead with good beer. Brewer and co-owner Jeff Vondenkamp was kind enough to fill in some blanks on the place and the people involved in this venture. Jeff has 7 years of homebrewing experience as well as time with Black Sands in San Francisco, and Wild Mind here in Mineapolis. Also involvolved in the brewery are Jeff’s parents Mark and Jan, as well as Carolyn and Joe Arndt. They have a 5 barrel brew system with 30 barrel fermentation capacity at this time, located in a sunken area and visible looking down from the taproom. I was intrigued by the wild yeast aspect of the brewery since not many folks are doing this on a professional scale, especially in Minnesota. The idea is to use naturally occuring yeast from the local environment to ferment the beer and get a truly unique and unusual taste to your beers. Traditionally this was how all beer was made, before Louis Pasteur (depending on who you ask) discovered yeast as the cause of fermentation. Traditional lambic breweries like Cantillon in Belgium use this method of “spontaneous fermentation” to get all of their beers fermenting. Jeff wrote up a blog post on how they do this for their website and you can read it HERE. In essence, they are taking wild fruit, leaves or bark and inoculating sterile beer wort with it, then scaling up and adding to a real batch of beer. Based on the results so far, I think they are on the right track here, and certainly have a cool hyper-local link to the area in each of these beers. 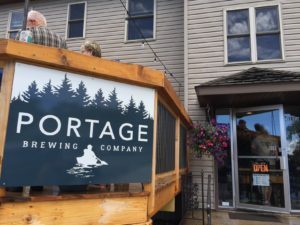 All of us were pretty happy with our visit to Portage Brewing and would recommend it to others. Tell me what you think if you travel up there and check it out! 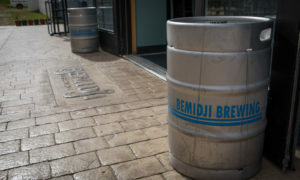 Our last stop on our beer tour up north was Bemidji Brewing, who had recently moved to a new taproom. 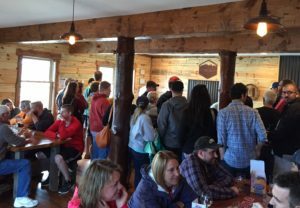 The building was pretty big, with only a small portion taken up by the actual taproom, but still plenty of room for long tables and a decent sized pinewood bar with corrugated metal front. The place wasn’t exactly sterile, but could do with a little more decoration or vibe. They had a limited food menu with burgers that really hit the spot for us hungry travelers! The taproom was quite busy and a bit loud, but not outrageous (see above) and we were able to finds seating pretty easily. Where Bemidji really shines is in their beers. I had one of their sour ales at a Winterfest or Rare Beer Festival a few years back and was immediately blown away by it. Really, a brewery up in the far north is doing a traditional Flanders Red style…and making it a flagship? Dogs and cats living together–mass hysteria! Here’s an extensive look at the huge amount of beers they had available on our visit. Two large samplers at once! So there, you go! 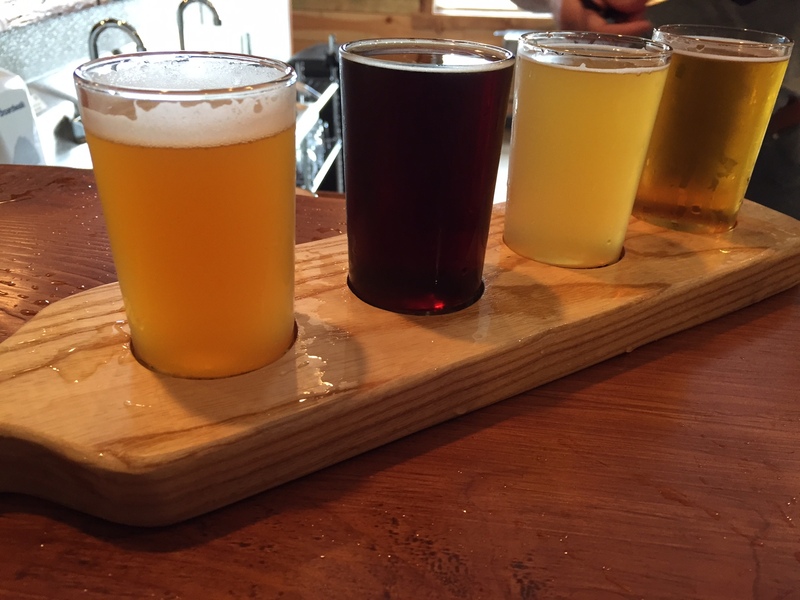 Overall really good beers and I took one for the team by trying them all for you! 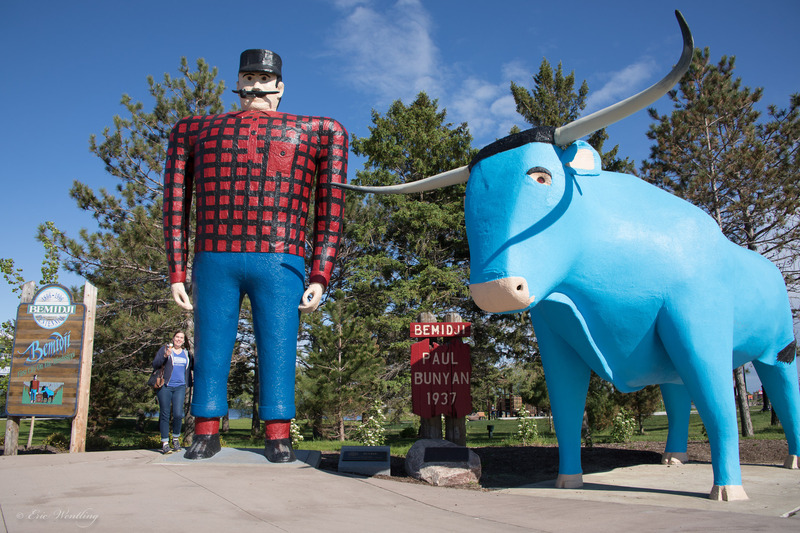 If you decide to visit Bemidji, molest Babe the blue ox (like my wife) and make sure to stop at Bemidji Brewing! I’m hoping we get some cans of this stuff in the Twin Cities soon!